One of USD’s oldest living alumni celebrated her 100th birthday at the Wakonda Heritage Manor on March 19th. Ruth Engman (formerly Ruth Pollman) graduated from USD in 1941 with a degree in education. After graduation, Engman taught school for 34 years in South Dakota towns including Hoven, Lennox, Wakonda and Centerville. Between school years, Engman returned to USD each summer to grow as a learner and teacher. She earned her Master’s Degree in German in 1971. Engman said typing and bookkeeping classes were her favorites to teach. The Smith Corona manual typewriter was her tool of choice. “They talked about computers, but in my mind I had no concept of what they were talking about,” she said. 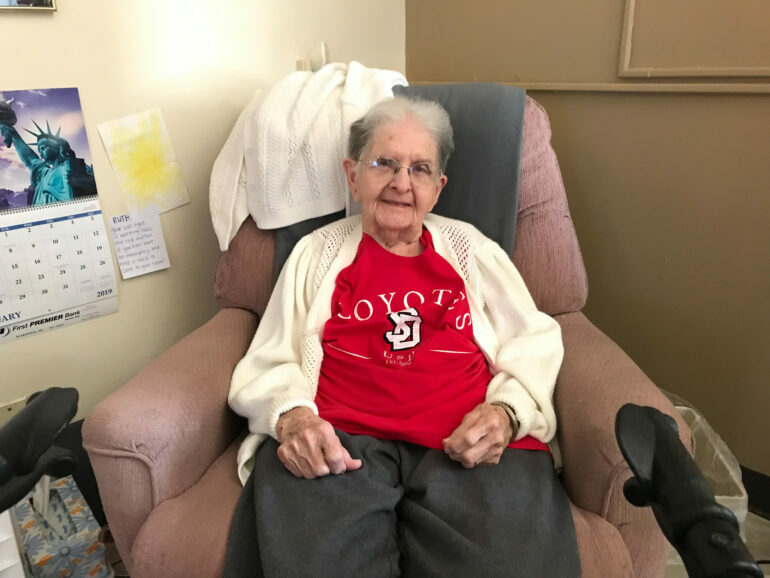 Engman said she chose USD because of the close proximity of her hometown of Freeman, S.D., where she was born on March 19, 1919. “I liked it (at USD). It was so close, and during the summer I didn’t want to sit around,” she said. She said she remembers watching football games, but not the rules. Both the state of South Dakota and USD are giving Engman special honor to celebrate her birthday. Gov. 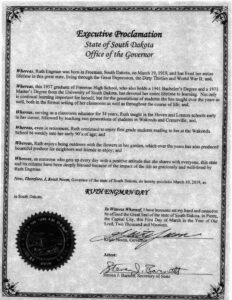 Kristi Noem issued an executive proclamation declaring March 19 “Ruth Engman Day” in South Dakota. USD ambassadors are planning to bring Engman along on a campus tour of her alma mater. Engman’s son, Paul, said the birthday party received a good showing from the local community and cards from the USD Foundation. Engman said she’s still grasping the thought of living a century.